Hibernate in style then walk out to nature's glory. 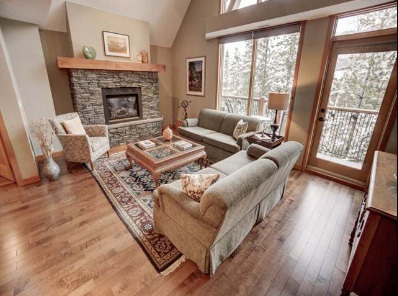 Alpine Homes has gone over the top with this beautiful townhome. Relax in a wonderful amenities building ~ enjoy indoor/outdoor hot-tubs, top-notch fitness centre, big-screen movie room and party area, after an active or interesting day in the mountains. Stainless steel appliances, designer series knotty alder cabinetry, granite countertops. Immense vaulted living room opens to a lofted 611sq/ft entertainment room/den on the lofted level. A formal dining area streams in warm south sun. The focal point of this home is the massive stone fireplace. Custom vanity cabinets and warm tile flooring are found throughout baths and kitchen. Stunning is not only a word that describes the immediate environs of Three Sisters Mountain Village but also a warm welcoming abode that exudes comfort. Walk directly from your two car underground parking stalls straight into your walkout lower level. Choose from four decks and one patio to relax on. Just Listed today - Give us a call at 403-678-2206 for more information on this gem.